Expatriated Russians and others who fought to liberate their homeland during World War II were summarily executed when the war was over. Between 1944 and 1947, over two million Russians who had been living in the occupied countries of Europe, some voluntarily, some not, were forcibly repatriated to the Soviet Union. Many met death by execution immediately, while others were literally worked to death in the hundreds of gulags that dotted the largest slave society in history. Whether these individuals were civilian or soldier, Soviet Premier Josef Stalin reasoned that anyone who had been living outside the borders of the Soviet Union was to be considered contaminated by anti-Soviet ideology and therefore could not be trusted. It mattered not that many had been forcibly removed from their homeland by the former German enemy. Approximately one million of the expatriates were military men who for various reasons took up arms against Stalin and volunteered to fight with Germany. Most, but not all, were Soviet citizens. Never before in the annals of warfare had so many soldiers abandoned their own side to fight for the enemy. The reasons for this say more about the horror of life under the Bolsheviks after the 1917 Revolution than Hitler’s Germany. Sadly, these happenings also say much about the British and to a lesser extent the Americans, many of whom were willing participants in the forced repatriation. It would not be until the 1980s that the awful truth began to emerge, that the world eventually knew as the Secret Betrayal. They were a disparate group, these Russians who wanted to stay in the West. Thousands had fled Russia at the time of the Revolution and had never lived in what became the Soviet Union. They all held citizenship in other countries. Before fleeing, many had fought with the White Army and for the czar against the Red Army and the Communists, then better known as the Bolsheviks. Therefore, they would forever be known as White Russians. In the summer of 1942, the war between the Soviet Union and Germany was in its second year, and the Soviets were losing. The Germans were driving hard deep into Russia. Soon they entered the Caucasus and the land of the Cossacks, the fierce and noble warriors of storied history. In the years 1917-1920, some of the toughest resistance experienced by the Red Army came from the Cossacks of the Don River Basin, the Kuban, the Terak, Orenburg, the Urals, and Astrakan—the six federated republics that had been formed by these fiercely independent people. The Bolsheviks showed no mercy, liquidating the Cossack republics in the cruelest manner. It is little wonder that when the Germans arrived they were greeted as liberators, accepting the flowers and gifts that descended upon them. As later events would prove, the Cossacks offered more than a glorious welcome, and German General Helmuth von Pannwitz would find himself commanding a quarter million of the world’s best fighting men. But the majority of those who came over to the German side had initially gone into battle as members of the Red Army, an army woefully unprepared for the better-trained, better-equipped Germans. Stalin had refused to believe that Adolf Hitler, who had signed a nonaggression pact in 1939, was about to attack, despite intelligence that said otherwise. On June 22, 1941, Operation Barbarossa caught the Soviets totally unprepared. The Russian soldiers went into battle with the German Wehrmacht to their front and the Soviet NKVD secret police at their back. They died by the hundreds of thousands and surrendered by the hundreds of thousands. When the Germans offered to abide by the Geneva Convention and allow the Red Cross to visit the POW camps, Stalin replied that there was no such thing as a Russian prisoner of war. From the beginning of the war, the German officer corps, most of whom who did not share Hitler’s racist theories, had plans to recruit Russian soldiers to its cause, and the recruiters were amazed at how easy it was, even after Hitler declared that since Stalin did not recognize the Geneva Convention, Russian soldiers would not be granted POW status. According to Hitler and other top Nazis, they were subhuman anyway. Of the 5,754,000 Russians taken prisoner after 1941, only 1,150,000 survived until 1945. Given the brutality of the Germans, it seems incomprehensible that so many were still ready to don German uniforms, pick up German rifles, and go forth to do battle against Stalin. To call them traitors strains the credibility of even the most prominent statesman. Indeed, they loved their country. It was their government they hated. Just 60 days after the beginning of Operation Barbarossa, the first major defection of Russian soldiers to the German side occurred. A Cossack unit, the 436th Infantry commanded by Major Ivan Nikitich Kononov, surrendered. Kononov laid bare his intentions to join the fight against Stalin. He told his troops how much he hated Stalin and then gave them a choice. “Those who wish to go with me take up their position on the right, and those who wish to stay take up position on the left. I promise no harm will come to those who wish to stay.” The entire regiment moved to the right. Kononov’s disenchantment with Stalin had begun during the 1939 war with Finland, when so many Russian soldiers had died unnecessarily. He had been waiting two years for his chance to desert. In his naiveté concerning the Germans, he did not realize he had left one evil to join another. German General Max von Schenckendorff knew of Hitler’s plans to destroy Russia as a nation, but how could he turn down another hard-fighting regiment? Kononov and his men were ecstatic that they were now the 102nd Cossack Regiment of the German Army. They would prove their mettle in battle as they cleared the steppes of the Red Army and communist partisans. While Kononov saw siding with the Germans as a chance to create a different homeland, German generals knew better. However, they were on the front lines and losing thousands of men daily. They welcomed help, no matter where it came from. In their defense, even though they knew of Hitler’s plans for Russia they may have held out hope that even the bigoted Nazi leader would come around when he saw the fighting quality of these subhumans. There was no real chance of this happening. Hitler would never give up his insane racist beliefs. But what the Germans were looking for was a Russian de Gaulle, a leader capable of molding one million Russians into an anti-Stalin army. They found him. It is too bad the Germans did not measure up to the man they picked. His name was General Andrei Andreievich Vlasov. He towered over other military men in both stature and intellect. He came from humble beginnings but had great integrity and was one of the ablest generals in the Red Army. To this day there is a statue of him in a White Russian community in New York State. Vlasov had been a strong believer in the Bolshevik cause and had helped defeat the White Army, though he did not join the Communist Party until 1930. Like so many, he became disenchanted with Stalin and his henchmen, realizing the Soviet Union had become a paradise for only a few and a living hell for everyone else. In March 1942, Vlasov was deputy commander of the Volkhov Front. By mid-June, his army found itself surrounded, and on July 13, 1942, Vlasov became a prisoner. The Germans knew they had captured a prize. Vlasov was placed in a comfortable camp, and the subtle propaganda of the Germans may not have been necessary. Despite Hitler’s orders, the Russian Liberation Army was taking shape, and by September 1942, Vlasov, though still a prisoner, had issued a leaflet calling on the Red Army and the intelligentsia to overthrow Stalin’s regime. From the beginning, the Germans proved to be unworthy allies. Added to the leaflet, without Vlasov’s knowledge, was Nazi propaganda calculated by the German high command to persuade Hitler to accept the Russian Liberation Army. Instead, the demonic dictator launched a tirade. How dare anyone suggest that the subhuman Russians were good enough to fight alongside the German soldier! But the Wehrmacht was undeterred. Again, against orders they organized the Russian National Committee with Vlasov at its head. On paper at least, the Russian Liberation Army (ROA) now existed. It is unfortunate that due to internal German wrangling and unabashed German stupidity this million-man army did not take the field as a single unit until the last few weeks of the war. Still, the question lingered as to exactly what would cause a million men to desert their comrades and go over to the enemy. It is doubtful that even the noble Vlasov could have stated the case so eloquently. An outgrowth of the Russian National Committee was the Smolensk Manifesto, which emanated from the city of Smolensk, home of the Kulaks, who suffered and died by the millions under Stalin’s collectivization plan in the 1920s and 1930s. The 13 points of the Manifesto declared there would be a united Russia, with abolition of forced labor and collective farms while land would be given to Russian peasants. Private commerce and handicraft would be reintroduced and the terror would cease. Personal freedom would be assured and also freedom of faith, conscience, speech, press, and assembly. The people would be able to work at their occupations of choice. All nationalities would be treated equally in the new Russia. Political prisoners would be released, and the government would be responsible for rebuilding the infrastructure. 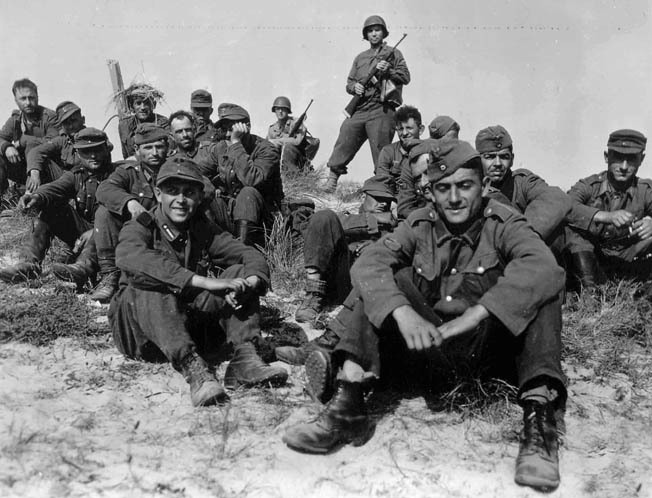 Dressed in uniforms issued by the German Army, members of the Russian Liberation Army sit under guard after their capture during the fighting in Normandy. Many of these men were returned to the Soviet Union after the war only to be executed. The Germans added a statement to the manifesto declaring, “Germany, led by Adolf Hitler, pursues the aim of creating a new order in Europe without Bosheviks or Capitalists.” Another example of German deceit, this addition would ensure that the manifesto would never be implemented. Broadcasting the manifesto was forbidden by the Nazis. The committee that developed it would never be seated in Smolensk. Soviet citizens in the occupied countries would learn of the manifesto only from leaflets dropped by planes, a plan arranged by German generals who still had hopes for a Russian Liberation Army. Only they understood that the war would be lost in the East without their help. Still, the leaflets themselves had an impact. Hope stirred in the breasts of those Russians who still thought freedom could be theirs. The commanders of the various German army groups were so impressed with the thousands who wanted to join Vlasov that they sent him on tour to talk to prisoners of war, Soviet volunteers, and civilians. In March 1943, Vlasov published a letter giving his reasons for taking up the fight against Bolshevism. When Hitler found out, he flew into a rage, demanding to know who had given Vlasov permission to do such a thing. Then the German dictator gave orders that the name Vlasov should never again be uttered in his presence. Despite frustration and disappointment, Vlasov soldiered on. He no doubt knew his more natural allies were the British and the Americans, but he also knew they would not see it that way. Even if they knew of the terror of Stalin’s Russia, they also knew that the Red Army was killing Germans, and Germany was the primary enemy. Vlasov had cast his lot with the devil in order to destroy what he considered to be a greater devil. He knew there was little chance of success for his plan. Despite all the barriers, Vlasov’s eloquent speech and imposing physique continued to strike a chord with Russians in the occupied territories, who saw him as their last best hope. It was through his efforts that conditions for both civilians and soldiers improved. The German yoke lightened, and while the Russian Liberation Army was not taking shape, more Russians soldiers were fighting alongside Germans. One German commander said that 50 percent of his troops were from Russia and other Eastern countries. By the beginning of 1943, a full 427,000 were fighting against the Red Army on the Eastern Front. During the autumn of 1943, approximately 80 percent of the Russian volunteers who had joined the Germans to free their homeland were moved from the Eastern Front to the Western Front. The Russians were now going into combat against people they had no interest in fighting—the French, British, and Americans—but all hope was not lost and help came from an unlikely source. In the beginning, Reichsführer SS Heinrich Himmler, like his Führer, had been adamantly opposed to Vlasov and any idea of a Russian Liberation Army. However, Himmler was more practical than Hitler. He understood the deteriorating situation on the Eastern Front. He had created the first non-German SS division in April 1943, with the formation of the Ukrainian 14th SS Grenadier Division. Since the division was under Himmler’s control, the soldiers had no real national identity but were promised that they would fight only on the Eastern Front. In March 1945, as the war became more desperate, the unit was renamed the lst Ukrainian Division. The troops fought well until the end. To Hitler, though, this meant nothing. On March 23, 1945, he exclaimed,”I have just been told to my amazement that a Ukrainian SS Division has appeared. I do not know anything about this. What is happening!” Yet, it was said that Himmler was proud of his Ukrainians. While the Russian Liberation Army came into being too late to make a difference, the Russian volunteers, despite being scattered among many German units, still saw Vlasov as their leader and the best hope for a free and independent Russia. By the middle of 1944, the practical Himmler scheduled a meeting with Vlasov that was to take place on July 21, 1944. Fate intervened with the attempt on Hitler’s life on July 20. The meeting was not held until September 16. Still, even at this late date, Vlasov, after meeting with Himmler, may have seen a glimmer of hope. Himmler, now the second most powerful man in the Third Reich and with the full confidence of Hitler, assented to the formation of a new committee, the KONR (Committee for the Liberation of the Peoples of Russia). Vlasov was to command all Soviet citizens living under German rule. Then, another complication arose. Many of the Soviet citizens now supposed to be under Vlasov’s command were not Russian. They wanted independence from Russia and had no desire to be part of a new Russia. Also, there were some old Russian émigrés who wanted to return to the days of the czar and to some extent saw Vlasov as too Bolshevistic. Other old émigrés, realizing there would be no return to the Czar, accepted Vlasov’s leadership. 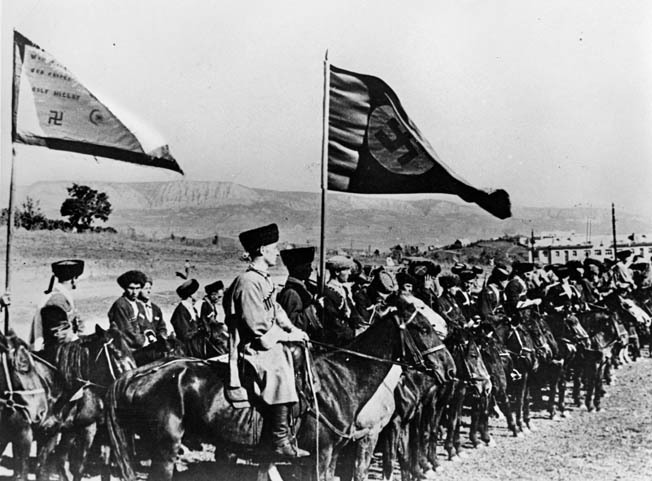 For Vlasov’s part, he saw the refusal of groups like the Cossacks and Georgians to be anything but independent as a defeat for the KONR. He refused to accept the congratulations of Germans who thought he had brought the various factions together. Yet, as long as KONR existed it remained under control of Russians who were Soviet citizens. A mounted Cossack unit lines up in ranks for a review. These expert horsemen chose to serve the Third Reich due to longstanding animosity with Josef Stalin and his communist regime in the Soviet Union. After the D-Day landings on June 6, 1944, it did not take long for Allied commanders to realize that they were not just fighting Germans. In fact, up to 10 percent of the prisoners taken were not German and a good many were Russian. Had the British and American commanders had any real understanding of Soviet society, they would have understood why these Russians seemed so content in their imprisonment. These were men who had been knocked around and brutalized all their lives, first by the Communists, then by the Germans. For the first time in their lives, they were being treated like human beings. They did not know such a world existed. Later, when notified that they would be sent back to the Soviet Union, many preferred death to repatriation. By November 1944, the KONR, though still referred to by some as the ROA, was finally taking shape. However, Vlasov was continually thwarted by German deceit and intransigence. He was growing tired of his messages to other Russians being altered or augmented without his knowledge. One such communication, which declared that equality for all would exist in the new Russia, was altered by the Germans to say that did not apply to Jews. Vlasov was not anti-Semetic and refused to sign the document. The Germans sent it out anyway without his signature. Despite this he continued on his chosen course because there was no alternative. By the time the KONR was ready to take the field, the Third Reich was in dire straits and there was a shortage of equipment. Himmler had deserted the project, turning it over to the Wehrmacht. He knew of Hitler’s objections and had decided the KONR was too little too late. It was time to think of his own skin. Vlasov had to contend with German commanders who did not want to release their Russians to the KONR since it would weaken their own commands. Indeed, if it were not for the thousands of new volunteers that flocked to Vlasov, the 21/2 divisions that were finally formed would never have taken the field. Vlasov’s men were finally an army, and on January 28, 1945, he took command. The German insignia was removed from uniforms and replaced by the KONR’s own. Considering the shortage of equipment, the two divisions and one brigade were well equipped by 1945 standards. They numbered 20,000 men per division and had adequate armor. The commander of the first KONR division, the 600th Panzergrenadier Division, was Sergei Bunyachenko. Operational readiness was not reached until mid-February, less than 90 days before the end of the war, and due to chaos in Germany it did not reach the front until the beginning of April. The second KONR division, the 650th Panzergrenadier Division, commanded by General G.A. Zveryev, never reached operational readiness. On March 29, 1945, the Cossacks who had been serving under General von Pannwitz decided to put aside personal differences with Vlasov and voted unanimously to join him in the fight. However, the Germans were still in control, and Himmler, who had already given up on the KONR, did not issue the order until seven days before the end of the war, much too late for the Cossacks to join Vlasov. Only two KONR formations ever took part in the fighting against the Red Army. A unit tried to dislodge the Russians from a bridge on the River Oder. The attack failed. 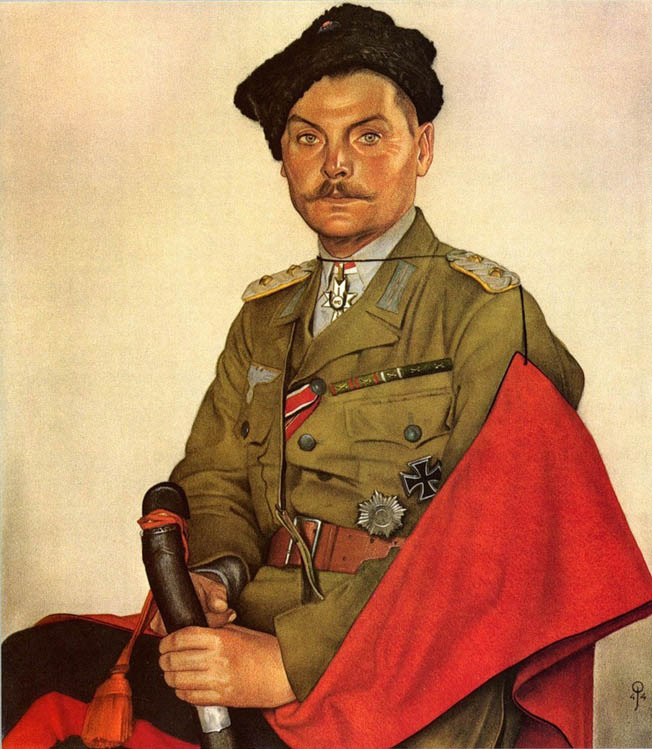 The most successful attack by the Vlasov men came, strangely enough, not against the Soviets, but the German SS. After the failure of the attack on the Oder, the Germans no longer had any control over the KONR. Vlasov hoped that Prague would be occupied by Americans. What they found were German SS and a Czech council pleading for help in ousting the Germans. The Vlasov men could not know that the Americans had no intention of entering Prague due to a prior agreement with the Red Army. The Czechs knew but kept silent. The Red Army had stopped, deciding to let the SS deal with the Vlasov men, thus saving their own troops. What followed was an agreement between the Czechs and the Vlasov men. “Clear our city of Germans and you will receive asylum,” said the Czechs. Vlasov did not believe them, but Bunyachenko and his men wanted to believe, and besides this was a chance to repay the SS for all the indignities visited upon them. They had no choice. They would fight the Germans and hope that the Americans would move into Prague, at which point they would surrender to them. Vlasov, now totally discouraged, saw betrayal coming—and it did. Cossack leader Ivan Nikitich Kononov sat for this portrait proudly wearing his German uniform, including the Iron Cross, a decoration for bravery. When the SS had been defeated, the Czech council informed Vlasov that the Red Army, not the Americans, would be occupying Prague. The Vlasov men, now completely dejected, began marching back in the direction from which they had come, hoping to run into the Americans. They did, but even that would turn into disappointment. On May 1, 1945, emissaries from Vlasov reached the lines of the Seventh U.S. Army near the village of Schluesselburg. By this time Vlasov was a completely disillusioned man. Urged to escape to the American lines, he said he must share the fate of his men. Bunyachenko pleaded with American officers to intern his army rather than turn the men over to the Soviets. He was told that since Schluesseburg was in the Russian zone his men could not be interned. The best the Americans could do was suggest that the Vlasov men try on their own to get to the American sector. Many tried, but few made it. Most were shot by Soviet troops. Some 17,000 were forcibly repatriated to Russia, where they were executed or worked to death in the gulags. Vlasov was captured by the Red Army while on his way to the American zone. The horror visited upon those Russians who either voluntarily or involuntarily found themselves outside the Soviet Union at the end of World War II (even sooner in some cases) is almost incomprehensible to those who have spent their lives in freedom. The British, and sometimes American soldiers, helped perpetrate this horror, which did not come to light for many years. Two men, both of whom would later become prime ministers of Great Britain, share most of the blame for upward of two million deaths: Harold Macmillan and Anthony Eden. Until the time of their own deaths, neither would admit to any wrongdoing. However, if this were so, why were they so careful to keep what they were doing from the British people? While German behavior in much of the occupied territories had been brutal, the German rule in the land of the Cossacks had been comparatively gentle. When Stalingrad fell, forcing a German retreat, the Cossacks turned west with them. As the Wehrmacht retreated even farther, the Cossacks retreated with them, finally ending up in northern Italy. Some of their leaders went back to the battle against the Bolsheviks, men such as General Peter Krasnov and General Vyacheslav Naumenko. Things went well in Italy for a while, but with the collapse of the German military, communist Italians partisans became more brazen. The Cossacks were ordered out of Italy and, after a perilous journey, ended up in Austria on May 3, 1945. The Cossacks, their numbers down to a mere 32,000, set up camp at the small town of Lienz. It was Easter Sunday, and the Christian Cossacks were jubilant. “Christ Is Risen!” they cheered. The leaders knew the war was over, and the only decision involved who would take their surrender, the British or the Americans. They chose the British. It was a decision the proud Cossacks would come to regret. Negotiations with the British were confusing, and efforts to contact Field Marshal Sir Harold Alexander, who was familiar with the Cossacks from earlier duty, failed. A sympathetic British officer, Major Rusty Davies, was soon given the duty of supervising the Cossacks, but as he was later to say, “This was not difficult because the Cossacks supervised themselves.” The one big mistake Davies made was coming to care about a doomed people. Davies did not believe the Cossacks when they told him of the horrors awaiting them in the Soviet Union until one day an old woman held up both hands from which the fingernails had been removed. Then he understood why the Cossacks said they would go anywhere but home. Things took a turn for the worse when the British confiscated the Cossack horses. When the Cossacks complained, they were told these were not Cossack horses because the Cossacks were prisoners. It was the first time the Cossacks were referred to as prisoners. The Cossacks became even more disturbed on the morning of May 27, 1945, when Davies told them that all weapons had to be handed in by midday. Davies, who had established a good rapport with the Cossacks, did not realize that the turning in of weapons would lead to something more sinister. He was simply the instrument his superiors were using to put a plan in motion. To soften the blow, the Cossacks had been given British uniforms. The next day the Cossacks were handed an order stating that all officers would be going to a conference held east of Oberdrauburg, where they would be addressed by Field Marshal Alexander. It was a lie, but Davies did not know. He reassured the Cossacks that everything was on the up and up. The question was asked but never answered as to why Alexander could not come in his staff car and talk to the Cossacks. Wouldn’t that be easier than trucking 2,000 people miles down the valley? The Cossacks dressed in their best uniforms. Nothing was too good for their friend, Field Marshal Alexander. Some of the Cossacks fell out along the way. They were suspicious, and their suspicions were well founded. When they arrived at the appointed place, they were met by General Musson, who announced, “I have to inform you that I have received strict orders to hand over the entire Cossack Division to the Soviet authorities. I regret to have to tell you this but the order is categorical. Good day.” With that the convoy was headed east into the abyss that was the Soviet Union. When Rusty Davies realized he had been part of a carefully planned deception, he asked to be relieved of his duties. His request was denied. With the officers out of the way, it was hoped the rest of the Cossacks would give little trouble. In a show of passive resistance, the remaining Cossacks linked arms and refused to get on the trucks. Troops waded in with rifle butts, pick axes, and bayonets. Mothers threw their children into a nearby river and jumped in after them. Fathers shot their wives, their children, and then themselves. British and American troops recall turning men, women, and children over to the Russians and then hearing the chatter of machine guns when the prisoners were barely out of sight. Of all the Cossacks sent into the hell of the Soviet Union, only Lieutenant Nikolai Krasnov would ever see the West again. After 10 years in the gulags, he was, on the strength of his Yugoslav citizenship, released. His grandfather asked him to write a book detailing all the horrors of the forced repatriation. His book was published in the United States but read by few. He died soon after, probably poisoned by the KGB. Its leaders had read the book. The forced repatriation of 1944-1947 was referred to as the “two million person holocaust.” The first holocaust was perpetrated by Nazi murderers, but some of the most highly regarded people in the world were involved in the second. They excused their behavior by saying that if they had not forced the repatriation American and British servicemen who had fallen into the hands of the Soviets might not have been set free. Most consider this a rather shabby excuse. On August 2, 1945, Vlasov was executed. One report said he was hanged with piano wire, a hook inserted in the base of his skull. Another report said the method of execution was too horrible to talk about. Tags Adolf Hitler, Allies, American Seventh Army, Andrei Vlasov, Anthony Eden, Axis, Bolshevik, Cossack, Eastern Front, Finland, General Geoffrey Musson, Geneva Convention, Harold Alexander, Harold Macmillan, Heinrich Himmler, Helmuth von Pannwitz, Ivan Nikitich Kononov, KONR, NKVD, Operation Barbarossa, Red Army, Russian Liberation Army, Sergei Bunyachenko, Smolensk, Smolensk Manifesto, Soviet Union, Volkhov Front, White Russians.